You are free to distribute, remix, tweak, and build upon this work, even commercially, as long as the author or licensor for the original creation is credited. 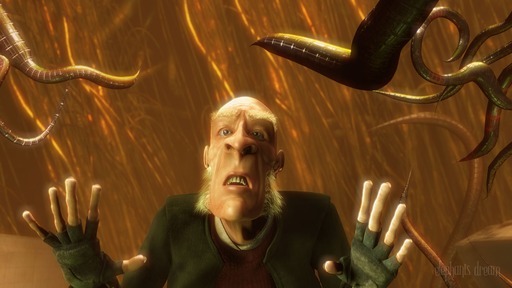 Elephants Dream is a story about communication and fiction, and the world’s first 3D animated “Open movie”. Elephants Dream is a story about communication and fiction, made purposefully open-ended as the world’s first 3D animated “Open movie”. The film itself is released under a Creative Commons license, along with the entirety of the production files used to make it (roughly 7 Gigabytes of data). The software used to make the movie is the free/open source animation suite Blender along with other open source software, thus allowing the movie to be remade, remixed and re-purposed with only a computer and the data on the DVD or download. Elephants Dream is the result of almost a year of work, a project initiated and coordinated by the Blender Foundation. Six people from the Blender user/development community were selected to come over to Amsterdam to work together on an animated short movie, utilizing Open Source tools only. Elephants Dream was developed in the context of an artist in residence project at the Netherlands Media Art Institute.